The Cooking Photographer: Beevil the Evil Makes "S'mores"
Beevil the Evil disregarded the tortured screams of Bernie, his latest victim, as he stood on the graham cracker platform slowly crushing his purple cousin to death. Instead of feeling sympathy, Beevil found himself annoyed at Bernie’s cries as he waited impatiently for him to suffocate. "What is taking you so long to DIE? ", he spat through gritted teeth. As the last breath left the victim's body, Beevil’s only thoughts were, “Good riddance to your perfect face”. For you see, Beevil’s eyes and nose were recklessly stamped on his chin and neck, instead of on his sugary face. Thus, Beevil was teased and harassed by attractive Peeps like Bernie all through school, by ones with their cute faces placed on correctly, and he swore that one day he would take his revenge on those snotty perfect Peeps. It was retribution he craved. After dropping out of sugar fluff school, Beevil and his two goons have been slowly snuffing out the lives of the “pretty ones”. Suffocating them between two graham crackers and microwaving them until their bodies blow up into balloons. “Ha! How do you like it now that you’re so ugly?” Beevil cackled. But the poor Peeps lay silent in death. Beevil is still at large, as he’s quite successful at disposing of evidence. He long ago realized if he left his gooey kills near hungry humans they would quickly devour the platforms, the chocolate body stretchers, and the bodies themselves. If you find one of these disturbing, but delicious “s'mores” on your plate, it’s possible Beevil the Evil has been up to his criminal activities again. And if you happen to spot Beevil in your Bunny Peep box, please eat him first and stop these horrific assassinations in the Peep community. Update: Read about Beevil's latest escapade here! Beevil's Death Platforms a.k.a. "Graham Crackers"
In a food processor, cream the butter and sugars together for about 30 seconds. Add everything except the flours and pulse until combined. Add the wheat and all purpose flour and pulse until just combined. Turn out onto a clean surface and knead a few times until combined. Wrap in wax paper and put in a container with a lid. Let rest in the fridge for about an hour. 1. Freezing unbaked cookies on the baking sheets for 15 minutes will help them hold their square shapes better. 2. If you like traditional holes and lines in your graham crackers, score the center of the cut dough with a cookie cutter on each cracker, and deeply prick each side a few times with a salad fork. Bake as directed. Graham cracker recipe & pictures by Laura Flowers. LOL! Funny post :) Love it! I'm actually glad I saw this, because I really had not realized I could use peeps for smores. Great way to use all those little evil marshmallow bunnies up! Very interesting story, btw. Though I see what you mean about the lineup of the stamped face. His face is reminiscent of the bunny cake I made with Hannah. I let her decorate and we got pretty much the same face as Beevil. Next Beevil will be on one of those infamous death panels pontificating from a "death platform." This is absolutly adorable,the problem is that it looks so good that I wouldn't be able to eat it. You are too, too funny! And, this is pure GENIUS...EVIL GENIUS!!! LOL--too funny! Esp the part about Beevil's face stamped on his neck--hahahahaha! Brilliant use of leftover Peeps. 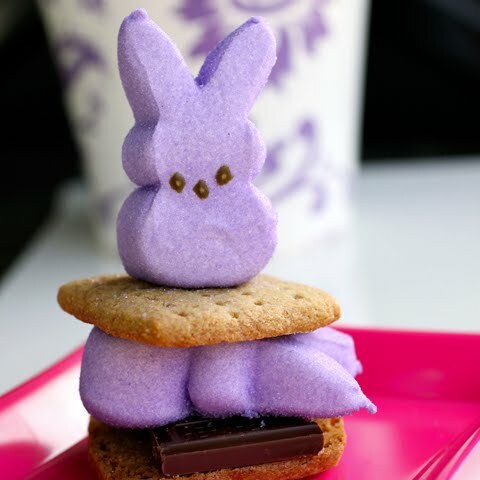 I never eat them but Peeps smore's would be perfect! Yes! Graham Crackers are on my 'to do list' and this looks like a wonderful version. Blowing up peeps has been an Easter tradtion in the family for years . . . strange but true. What an adorably sinister tale! 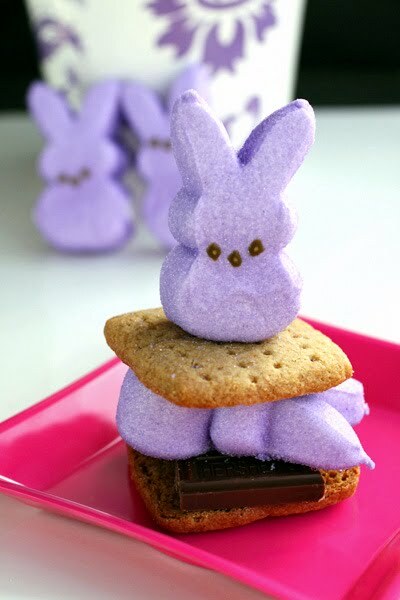 Great idea to use leftover peeps! splendidi e adorabili!! bravissima! ciao! These look so fun! Simply adorable! It warms my heart to find another peep lover out there. I LOVE them, but, alas, I overdosed on them last weekend. Marking this one for next year! Gorgeous! I included your s'mores in my roundup of what to do with leftover Easter candy on my edible crafts column (ediblecrafts.craftgossip.com). Thanks for sharing! LOL! This is a must try. Great post - it's so funny!! LOL... So funny :) Love the homemade grahams, too. The graham crackers look magical. I made some peeps smores too. It is so much fun harming peeps. ... God. Those eyes... those empty sugar eyes. HA HA HA HA HA HA! Too clever! And evil! But why oh why didn't we get to see what they look like after they're nuked? Eaten too fast? Hahah, I love your story (you should so write children's books ^_^). Pretty sure us humans win either way. I'll gladly eat a victim s'more or a Beevil s'more to give him a punishment suiting his crimes mwahaha.